Part of the magic of these notifications is that they can appear even when we're not currently on that website to give us that information (after you've approved it). On mobile devices, where supported, you can even close the browser and still get them. Firebase Cloud Messaging which lets us "reliably deliver messages at no cost"
In this part, we'll only focus on the front end, including the Service Worker and manifest, but to use Firebase, you will also need to register and create a new project. To reflect the current subscription state, we need to adjust the button's text and style. We can also check if the user did not allow push notifications when prompted. Let's say the user visits us for the first time in a modern browser, so he is not yet subscribed. Plus, Service Workers and Push API are supported. When he clicks the button, the subscribeUser() function is fired. Otherwise, we want to save the token. With .once('value'), we receive the key values and can check if the token is already there. This serves as second protection to the lookup in localStorage in initializePush() since the token might get deleted from there due to various reasons. We don't want the user to receive multiple notifications with the same content. Another example would be synchronizing data in the background. Read Google's article about that. When we are subscribed to notifications of new posts but are already visiting the blog at the same moment a new post is published, we don't receive a notification. The last step for this part of the series is adding the Google Cloud Messaging Sender ID to the `manifest.json` file. 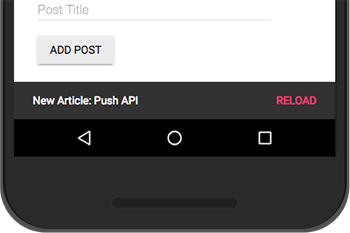 This ID makes sure Firebase is allowed to send messages to our app. If you don't already have a manifest, create one and add the following. Do not change the value. Now we are all set up on the front end. What's left is creating our actual database and the functions to watch database changes in the next article. Just for curiosity, in the section “Show Messages when on Site”, is this approach also doable in Safari and Edge? Can we use this to create a “messaging experience” in a Webapp? Most of the tutorial that I have read relies in the Push Notification features from Chrome, but what we can do to provide on site messaging into others browsers? No. 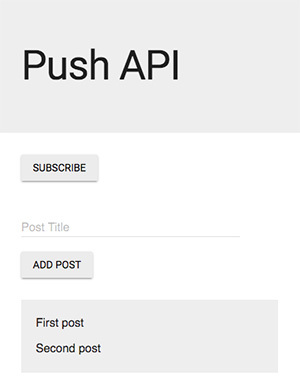 See caniuse for “push API”. Push notifications are not specific to Chrome. They work in Firefox, Samsung Internet and Opera, too. The browser needs to support Service Workers first of all which Edge and Safari only do in their previews. Safari also has its own non-standard implementation of a Push API. You could use that. that’s what i was looking for. when will the second part come? Great, but is there an alternative to firebase ? Or, is it possible to have in self hosting solution ? Hi friend. I’ve cloned the Github repo, but it is very different to the example exposed here, I wanna know how to put it to work. When are you going to post the second part? how is the repo different to the examples here? The second part was already online when you wrote this.